The Haeckel collection at ullstein bild includes both, contact prints and glass negative plates by the photographers Otto and Georg Haeckel. The photographs represent the world's most comprehensive Haeckel-collection. Within the framework of a project at ullstein bild - headed by Dr. Katrin Bomhoff - the contact prints have been captured in text form and digitized, with a total of over 10,000 motifs. Currently we are working on the scientific indexing of the entire collection. Therefore we would be pleased to receive all contemporary documents on Otto and Georg Haeckel or other important information in regard of the two brothers and their work at: info@haeckel-foto.de or by mail at: ullstein bild, Dr. Katrin Bomhoff, Schützenstr. 15-17,10117 Berlin. The Haeckel collection at ullstein bild in Berlin comprises the work of the two photographers Otto (1872-1945) and Georg (1873-1942) Haeckel. The subjects of this early press photography include motifs from all parts of the world: Impressions of everyday life, views of cities and landscapes, current political events, religion, economy, technology, sport and portraits. 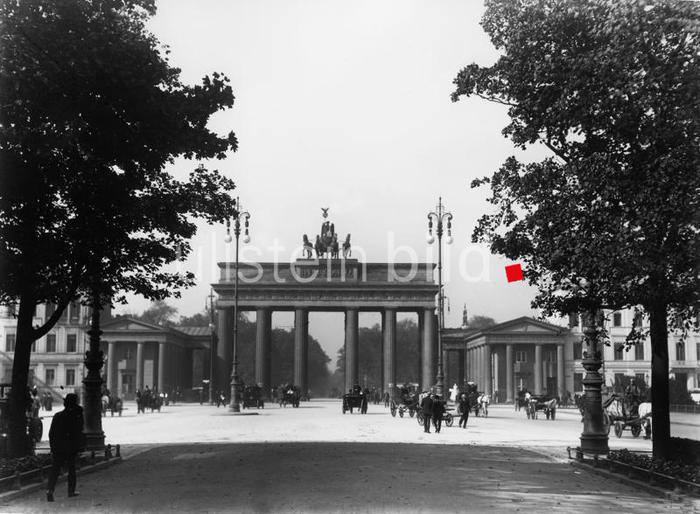 In addition to a brilliant world tour through the continents of Europe, Africa, Asia and America, a recognizable thematic focus lies on Berlin, where architecture, genre, political events, portraits of well-known contemporaries, and social life were main topics. The Haeckel brothers, who were born in Sprottau in Silesia, came to Berlin as early as 1905 and founded their own photo agency shortly afterwards. They supplied all important publishing houses of their time, not least Ullstein Verlag in Berlin, and are undoubtedly among the most renowned press photographers of their time. At that time, Berlin is one of the manifolded of newspapers in Europe. 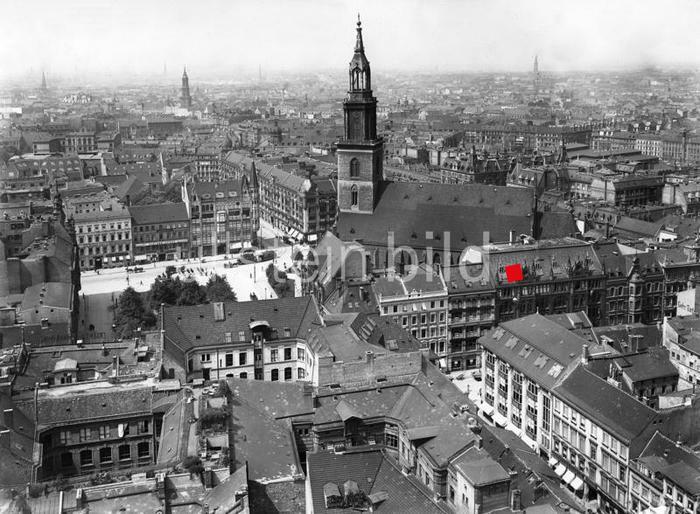 Caused by the economic boom of this time, the enormous growth in Berlin and the exploitation of important technical developments concerning newspaper printing, information transfer and distribution possibilities, the large and lively "Berlin Newspaper Quarter" was created. Alongside Rudolf Mosse and August Scherl, Leopold Ullstein and his sons were among the founders of a wide-ranging press landscape and its economic success. Dozens of newspapers were produced and several times a day delivered. 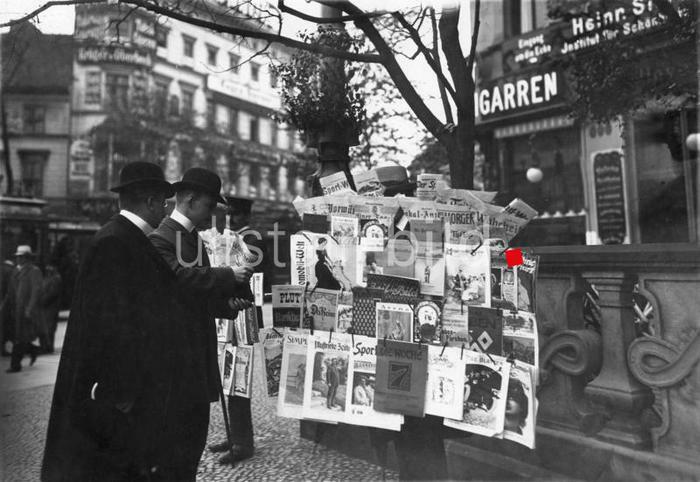 In the midst of this offer is the "Berliner Illustrirte Zeitung", founded in 1890 as a subscription newspaper by Otto Eysler. In 1894, after initial cooperation with Eysler, Leopold Ullstein became the sole owner and helped it to rapidly increase its circulation. Most of all, the newspaper benefited from technical innovations that Ullstein took advantage of. They primarily affect what already resonates in the name of the "Illustrirten": the photography. In 1902, the first "complete rotary press" allowed the printing of the "Berliner Illustrirten" in a single printing process. For the technical development of the reproduction of photography, this was an important step after the introduction of the autotype at the end of the 19th century. The print shop worked much faster and more cost-effectively with this process. Suddenly, inserting images into the text no longer means having to accept considerable price increases and major risks. It is not difficult to imagine the far-reaching consequences this would have for press photography: the photo would gain in importance, become more and more equal to the text as an image report or would even completely capture the power of the publisher. Haeckel at the "Berliner Illustrirte Zeitung"
The Haeckel brothers worked often and variedly for the "Berliner Illustrirte Zeitung". To supply a daily newspaper of this art means to capture the current events in a meaningful way, but also to master portrait, architecture and travel photography, to capture everyday scenes. Each of these photographs stands up to individual scrutiny. The term "Momentphotographie" (snapshot), which appears again and again in the captions, does not only speak of the possibility of capturing movement in the picture. It emphasizes the significance of the events, the topicality of the reporting, even the vehemence of the news transmission and its bundling of the moment. Press photography compresses the extraordinary, directs the viewer's gaze to what is essential. Otto Haeckel accompanied the members of the Reichstag on their journeys through Deutsch-Ostafrika. During the First World War, the brothers worked as war-photographers. In the following they took photographs during the November Revolution, portrayed numerous personalities, and developed a global network of business relationships. Outstanding moments, unique and emotional images - from the beginnings of photography to the modern times - characterize the collection of ullstein bild. Our photo collection has been known for its expressive visual language since 1877. ullstein bild is a brand under the roof of Axel Springer Syndication GmbH and one of the most important European agencies for contemporary images. The cooperation with well-known partners guarantees our customers access to current imagery from all over the world. Whether politics, economy, culture, sport or personalities - let yourself be surprised by the variety! Great photo artists and famous photographers like Yva (Else Neuländer-Simon), Madame d'Ora (Dora Kallmus), Martin Munkácsi or Waldemar Titzenthaler stand for impressive photography, individual expression and sometimes very personal perspectives. Through ullstein bild you can access the works of these outstanding photo artists. In addition, we work together with outstanding partners worldwide, such as: The Granger Collection (USA), Roger-Viollet (France), TopFoto (Great Britain), Fratelli Alinari (Italy), Iberfoto (Spain), Imagno (Austria), Rex Features (Great Britain), photo12 (France). The world's most comprehensive collection of photographs by the two press photographers Otto Haeckel (1872-1945) and Georg Haeckel (1873-1942) can be found at ullstein bild. The Haeckel brothers are among the most renowned press photographers of their time. Their work uniquely reflects, among other things, the imperial era, the First World War or the Weimar Republic. We have scanned the contact prints of over 10,000 outstanding images on glass plates in an elaborate and high-quality process and made them available to our customers. For almost any kind of use you can get licenses for over 9 million photos from us. In addition, we support you at any time with image research - no matter how exceptional - or support you with your exhibition projects.